When you finished Catcher in the Rye as a teenager, did you feel like someone finally understood your misunderstood self…OR were you captivated by Holden Caulfield’s go-to restaurant order: “a Swiss cheese sandwich and a malted milk?” When you read (or saw) Silence of the Lambs, were you amused by Hannibal Lecter’s famous line — “I ate his liver with some fava beans and a nice Chianti” — ….OR were you impressed that the doctor knew how fava beans and liver were, in fact, a classic combination appreciated by a refined palate? You weren’t? I’ll tell you who did have those reactions: Cara Nicoletti. 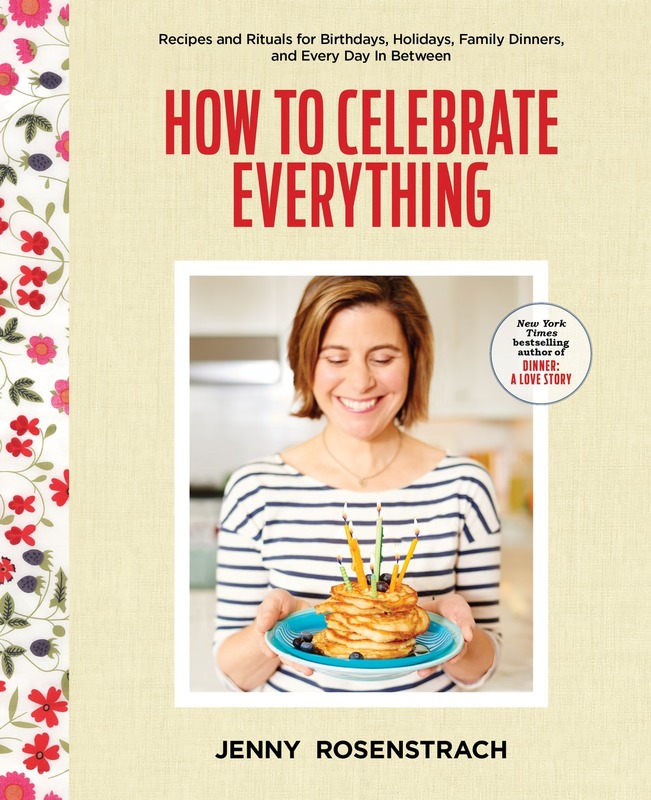 You might know her from her great literary recipe blog, Yummy Books, or you might know her because her charming memoir Voracious (referring to her lifelong ravenous appetite for both books and food) was just published. 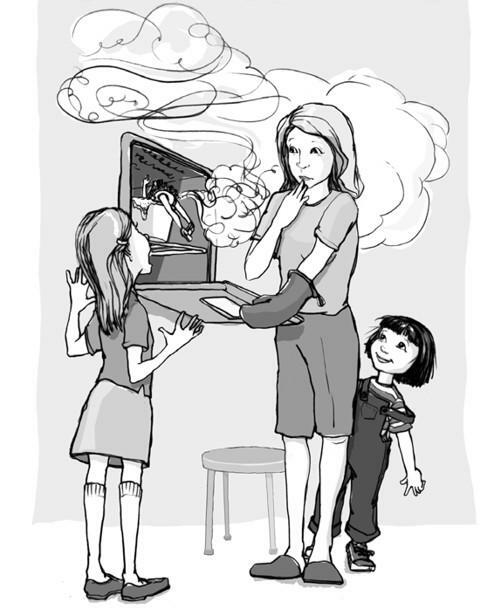 Today, she guest-posts for DALS about five important lessons she learned through her favorite childrens’ books. Take it away, Cara! The Lesson: Think about where your food comes from. Growing up in my grandfather’s butcher shop, I knew well what the meat I ate looked like before it landed on my dinner table. 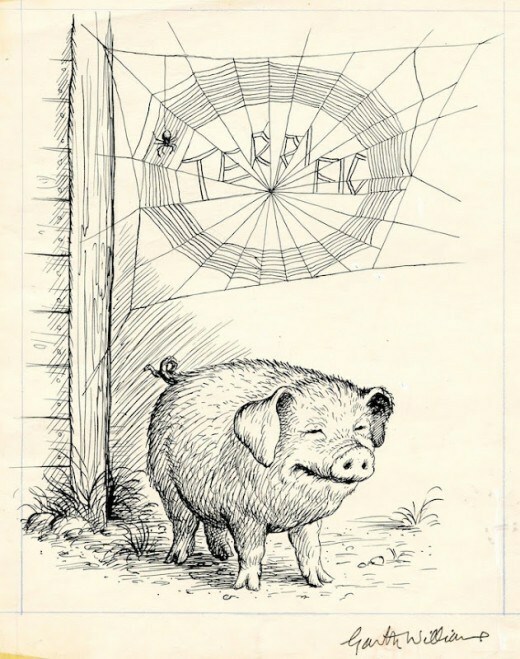 It wasn’t until I read Charlotte’s Web in the third grade, though, that I started thinking about meat from a moral standpoint. Reading the book, one might think that White was himself a vegetarian, and urging all of us to be the same. I was surprised when I learned as an adult that not only was he not a vegetarian, but he also raised his own pigs for slaughter on a small farm. Whether you eat meat or not, White tells us, it’s important to face the entirety of the process before you make a decision—to think critically about what you are eating, to ask questions, and be ready to hear the answers. The lesson: Be a humble kitchen student, don’t be hungry for glory. 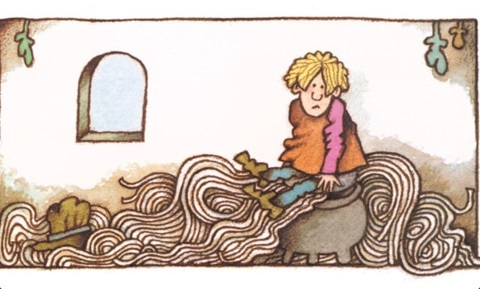 Tomie dePaola’s Strega Nona is a genius in the kitchen, known in her small Southern Italian town of Calabria not only for the pasta she produces from her magic pasta pot, but also for cooking up potions that can do everything from cure warts to make people fall in love. As Strega Nona’s apprentice, Big Anthony has the very rare opportunity to learn from a master, but he is too distracted by his own desire to win the favor of the townspeople by making pasta for all of them, that he completely ignores her teachings. Instead, he covers the town in a blanket of pasta and has to eat his way out of it. It’s a good reminder that when you have the opportunity to learn from someone much more skilled than you are, to put your ego away and listen. The Lesson: Pay attention! Don’t let your mind wander too much while you’re cooking. 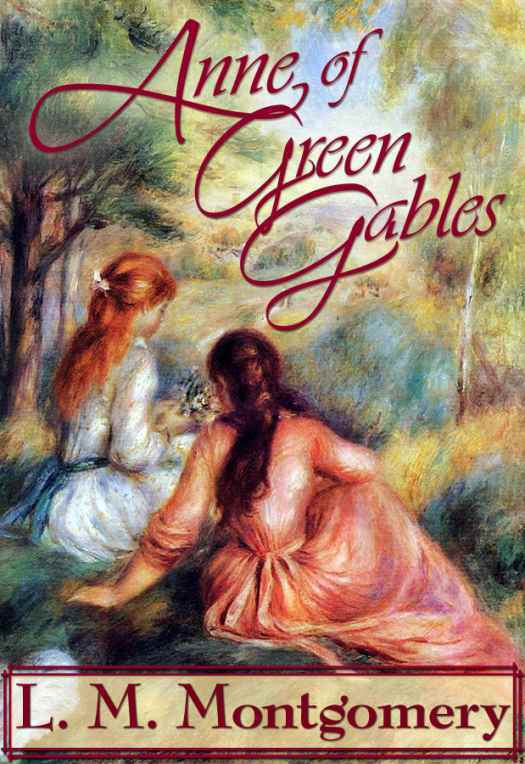 No one knows the dangers of a wandering kitchen brain quite like Anne Shirley of Anne of Green Gables—her imagination is constantly getting in the way of her cooking. She forgets to put flour in one of the cakes she’s baking, because she’s busy daydreaming about smallpox, and then, while baking another cake, she mistakes liniment for vanilla extract. Distracted again, she gets Diana drunk on what she thinks is raspberry cordial, but what is actually currant wine, and later, while making plum pudding, she gets so wrapped up in a fantasy about being a nun that she forgets to cover the pudding sauce, which results in the drowning death of one very unfortunate household mouse. One of the reasons I love to cook, is because of the peace it brings to my brain, but it’s important to keep this brain relaxation in check—even the recipes you’ve cooked a thousand times still take a certain amount of focus. The Lesson: Be Flexible, improvise! An enormous part of cooking is figuring out what to do when things go wrong—when you don’t have buttermilk and can’t find the lid to the blender and your cheese sauce breaks and the smoke alarm goes off. 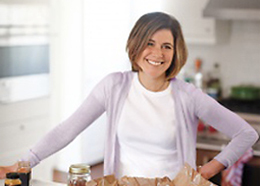 Ramona and Beezus find this out the hard way in Ramona Quimby, Age 8, when they are given the task of making their mother’s chicken thighs and cornbread, guided only by a smudged and illegible hand-written recipe, and the vague inkling of how their mother does it. They can’t find cream of mushroom soup, so they substitute yogurt. No cornmeal? Cream of wheat will work fine. And just what are those red specks that usually dot the chicken? Better just have a look through the spice cabinet and see what looks and smells right. One of the reasons people are so afraid to cook is that they convince themselves that there is only one good possible outcome, and that it comes from following a recipe exactly. The truth is, food is generally pretty flexible, and you should be too. Don’t be a slave to your recipes, experiment! Have fun! It will make you a better cook in the end. The Lesson: Eat seasonally, use the entire animal. Having lived my entire life in the age of the supermarket, where everything is in season at all times, I never had any idea as a child that a lot of foods are (and should be) seasonal. 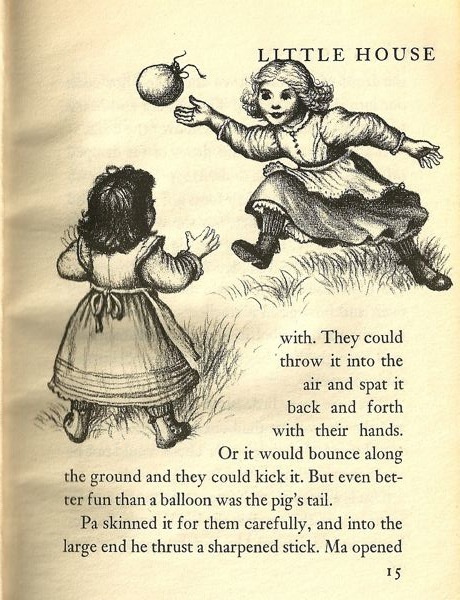 I knew that we picked apples and carved pumpkins in the fall, and that we ate peaches and berries in the summer, but that was the extent of it—until I read the Little House series. Everything the Ingalls family eats in the series is dependent upon the season—the only times they eat things that aren’t currently growing, it’s because they’ve been preserved from previous seasons (also something I had no idea about). The series was instrumental, too, in teaching me the importance and wisdom of using the entire animal after butchering it. As a child, I knew about off-cuts, because they were often what we ate for dinner when they didn’t sell at my grandpa’s shop, but making use of an entire animal from the nose to the tail wasn’t something I had ever thought about. After butchering a pig, the Ingalls make headcheese and sausages, roasts, salted hams, rendered lard, fried tails and ears—even the bladder gets made into a balloon! This was thrilling to me as a kid, and it still is all these years later in my work as a whole-animal butcher. Nicoletti, who comes from a long line of butchers, works at the Meat Hook in and teaches sausage-making at the Brooklyn Kitchen. 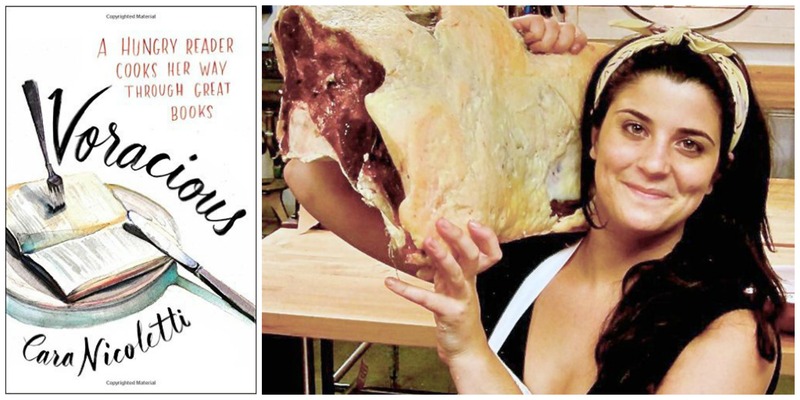 For more on how books have inspired her cooking, listen to Christopher Kimball interview her on America’s Test Kitchen. 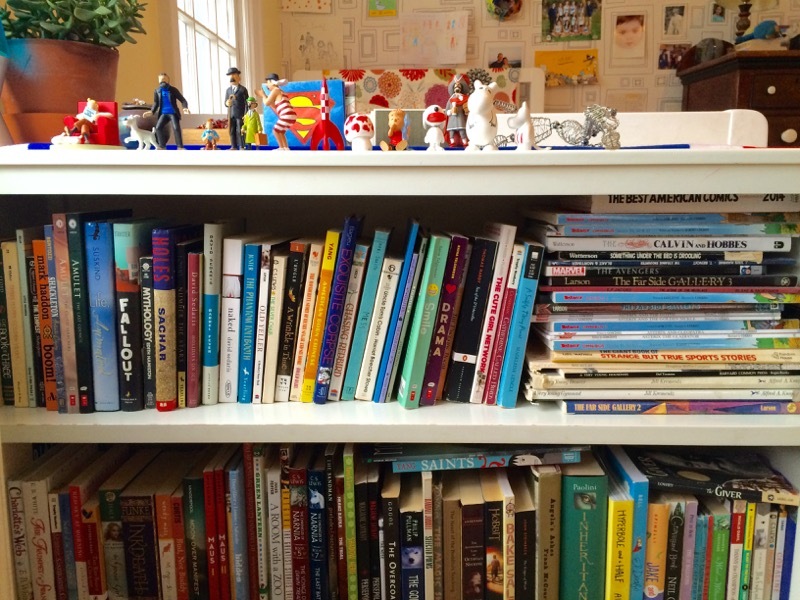 Photo way up top: My 13-year-old’s bedroom bookshelf. Strega Nona! I love it. I love everything Tomie dePaola, but especially this one. The other takeaway from this book? Don’t forget to blow your meal a kiss! A sweet reminder to express gratitude for the food we prepare and serve and enjoy. Thanks for the reminder on this book – I should add it to my story posts. And Pancakes for Breakfast another favorite here! This is such a great post. 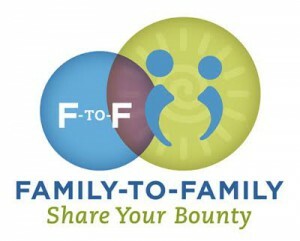 Can I respectfully add the All-of-a-Kind Family series? The author Sydney Taylor does a wonderful job showing how central food was to the family life and religious life of this turn of the 20th century Jewish family. I vividly remember the scene when Sarah wouldn’t eat her soup at lunch, and I also still remember the respect and time Mama gave the food preparation for the meals eaten during their religious observances. The lesson learned, I think, is to respect food and it’s place in the rituals of our family life. Frances books by Russell Hoban. Those badgers eat some FABULOUS things!!!! Ramona making dinner for her parents is one of my favorite food scenes I’ve ever read. Another lesson from that scene was to set the table with care- Ramona and Beezus lit candles so their parents couldn’t see how bad the food looked. Thank you for the post- it brought back so many memories of the books I read as a kid. I was obsessed with the food in the Betsy- Tacy books when I was kid. I think I got over my dislike of onions because of the author’s description of onion sandwiches. Nice to read what kind of kids books are an inspiration on the other side of the ocean. Here in Europe we have a book about a worm who is always starving and wants to eat more and more. I love that book. It tells you about life in an very fun way! I’m still reading and rereading Ramona books thirty years after reading them for the first time. There are just so many lessons! This is a great list. Thank you.